With my trusty Osprey Kode 22 on my back and my 30D in hand, I am all over my area of the oldest mountains in the world. My treks take me to a good many interesting places and two of them I show you here. The hike to the summit of this thing is not all that strenuous, though there are some steep areas of trail along the way. For the most part one travels at a moderate climb through a mixed forest of deciduous trees, conifers, and Rhododendron thickets, the first mile or so being along a cold mountain stream before beginning the acutal ascent of about 1000 feet in an appreciable gain of elevation. The white specks atop the rock are that of people. These monoliths are granite, once magma having been pushed up from the core of the earth, cooling and crystalizing into what you see here. 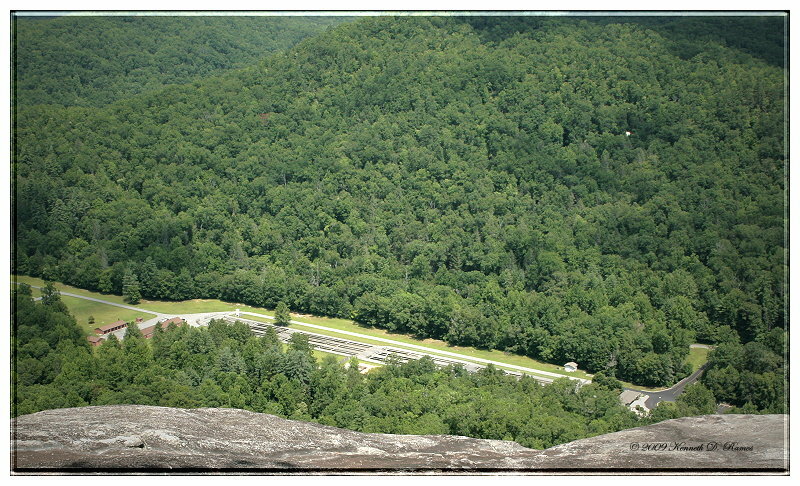 Atop John Rock, one has a spectacular view, here looking down on the Pisgah Center for Wildlife and Nature Resources Center and the fish hatchery below. 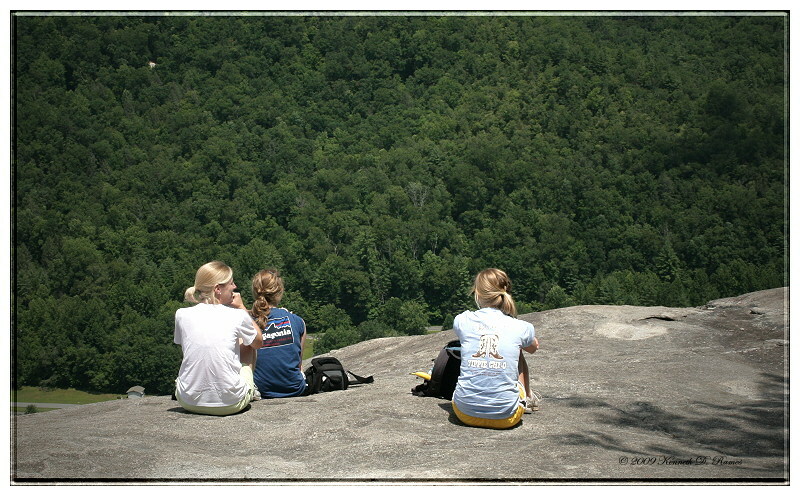 I have no idea who these young ladies are but however, they do provide excellent scale to give you some idea of the surface area atop John Rock. As you can see there is plenty of room to walk about and to sit down and relax. Notice also there are no protective barriers here. 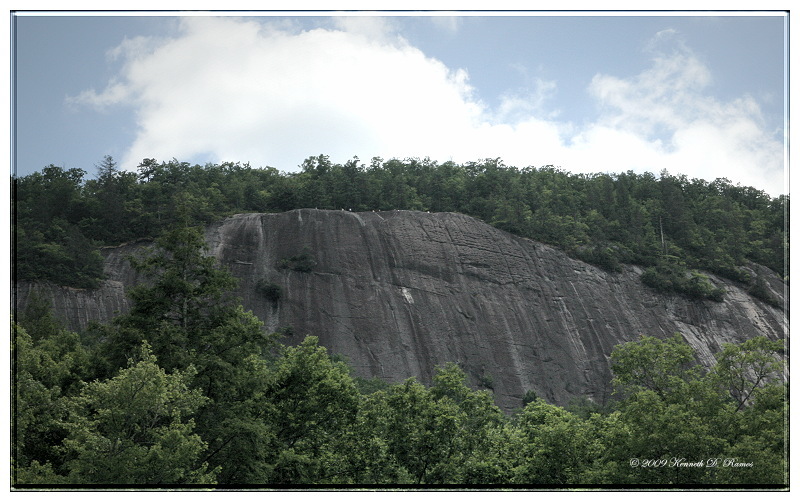 The trail to the summit is not publicized, probably for obvious reasons but however that to the summit of Looking Glass Rock is, being way much higher up. 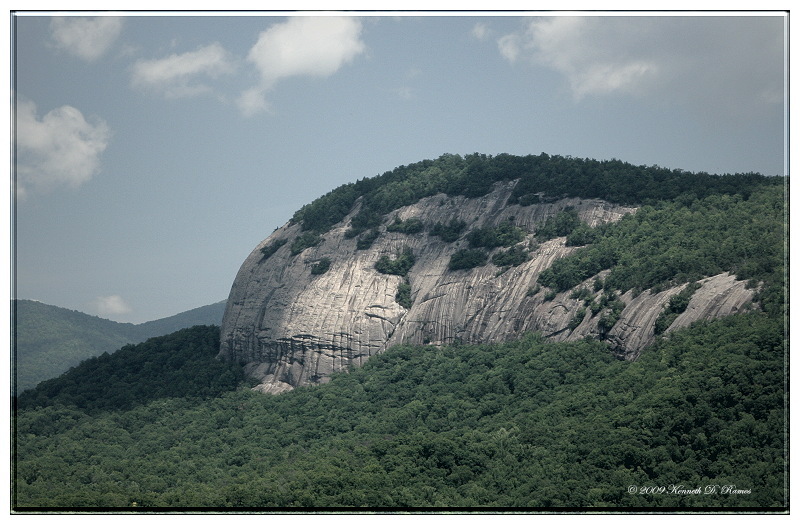 This is Looking Glass Rock as seen from John Rock, across the way of about three miles or so, maybe, I am not sure and not a good judge of distance. When I hiked Looking Glass, I began at 10:30 AM, I remember having looked at my watch afore hand. When I returned to my car, it was 3:30 PM that afternoon with only a half and hour spent atop Looking Glass. Appreciable gain in elevation at Looking Glass is about 1700 feet and there is a natural granite "helio-pad" up there too! So, if you do something stupid they have a place to land to gather up what is left. Three miles and about two and one half hours to the summit, one way, Looking Glass is an extremely strenuous hike. The trail to the summit is not for those who are out of shape or may have health issues. There are a number of switch backs with stomach churning views of the trail below you, from which you just came. Twice I considered giving up and turning around and going back, when I hiked this monolith. Though now, I am glad that I did not. One has to be careful here, the trail abruptly puts you out on the face of this rock and it should be entered onto with care, as it is round of course and there is no edge. This is impressive terrain, Ken. No thanks! I'll just stay back here where we keep the little kids. Precisely why on occasion, a few people at least once a year fall off of stuff around here, there is actually no edge to these things. Yes I agree 100% that staying back where we keep the little kids is the best idea. While sitting atop Looking Glass, I was chatting with a family from Florida and a very nice looking young lady came up from out of nowhere off that round dome of Looking Glass! We all sort of looked confounded at one another and assumed the young ladys sense of adventure was far greater than that of our own. Yes if you like a good strenuous workout on the trail, Looking Glass is one not to be missed. I plan to make that trek again but not anytime too soon. That is one impressive cliff there, Ken. And with not much woodland left at my place, I enjoy looking at your dense forests. Can imagnine that they are a good place to rummage up intersting critters to be photographed. For some odd reason, people like to climb up and dangle off these rocks in one fashion or another. A couple of summers ago, a climber fell from Looking Glass, "rope broke!" Though he/she bearly survived the fall of over 100 ft. Yes I would have to admit that our forests are pretty, to bad there are not more like them but "clear cutting" has done away with much of them around the world, for pasture land. The blue haze one sees in the/our mountain forests, is the result of "Isoprene" being released by the leaves of the trees on bright sunny days. From what I understand, "Isoprene" is the precursor to "Ozone," of which we are running out of last I read. We need our trees and those of them that have been cut, we need them back, albeit I am afraid now that what ever we do will be too little to late, as the damage has been done. The Holocene thing you know... And yes, there are "critters" in abundance here. Just in the Smokey Mountains National Park alone, less than 50% of the biomass has been cataloged. Scientists speculate that we know very little about what all lives in these mountain ranges or in the entire Appalachian Range as a whole.